Written by Alan Rust on 14 August 2010. Welcome to the CAHS website. In order to access the members area you will need to subscribe to either a Traditional (magazine) subscription or an Online Subscription. Please choose your preferred option from the choices in the left panel depending on which country you want the Journal delivered to. All subscriptions are for one year. Traditional Subscriptions include four issues of the Journal for the year you subscribe, so if you subscribe between January 1 and December 31st of any year, you will receive all four issues of the Journal for that year as well as access to the online Member's area. Online Subscribers receive four issues of the Journal in PDF format and also access to the online (FlipBook) version of the Journal. For those who are going paperless, are on the move, or have limited funds, we are now offering an online membership. 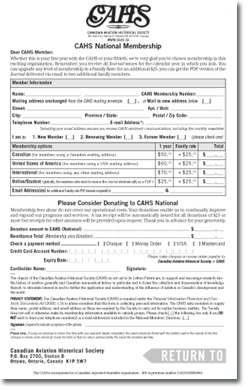 You still get all the CAHS membership benefits, but instead of receiving a hard copy of the Journal quarterly you access it online. Members in this category will receive access to the four Journals in the year where their memberships where active. i.e. - if you join in November 2013, you will receive the four online versions of the Journal issued in 2013. Traditional membership - see chart below For those who still love holding a glossy magazine in their hands, we’ve kept our traditional membership. Although the membership year begins January 1st, you’ll receive the rest of that year’s back issues regardless of when you join! *Please note all prices are in Canadian dollars.